A Friendly Film Company Pty. Ltd. 1982. Director: Michael Robertson. Music: Brian King. LP (ST) Infinity. L-37755. 1981. 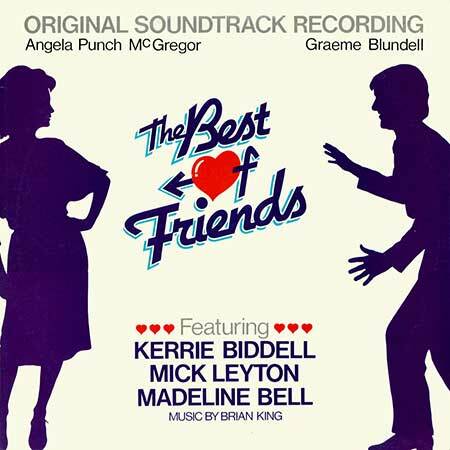 '"NSW FILM CORPORATION AND THE FRIENDLY FILM COMPANY PRESENTS ORIGINAL SOUND TRACK RECORDING "THE BEST OF FRIENDS"." Composer Brian King. Produced by Brian King. Engineer: Martin Benge. Strings and Horns Arranged by George Brodbeck. Drums - Joe Tattersall. Bass - Rick Price. Guitar - Ken Francis. Keyboards - Brian King. Music Advisor - NSW Film Corp. Phil Matthews. * Produced by Theme International (Music) Ltd. I Guess It’s Time (We Called It A Day). (2:34). Here We Go Again	(Instrumental with film dialogue). (3:27). The Best Of Friends. (3:06). v: Mick Leyton. (Madeline Bell - Kathleen Poppy - Les Hurdle). v: Madeline Bell. Amber (Dinner For Two) Instrumental. (3:25). I Guess It’s Time (We Called It A Day) Instrumental. (3:58). Here We Go Again. (3:25). v: Kerrie Biddell, Mick Leyton. The Best Of Friends Instrumental. (3:30). You’ve Got What It Takes. * (3:15). Peach Pie (Melanie’s Dance) Instrumental. (5:36). The Best Of Friends Medley Instrumental. (2:46). Side a: “I Guess It’s Time (We Called It A Day)”. v: Mick Leyton. Side b: “Here We Go Again”. v: Kerrie Biddell and Mick Leyton.